Jay Carney doesn’t have an answer for that. He hasn’t discussed that subject with the president. He will refer you to the Department of [insert agency here]. He refuses to speculate on that. He’ll have to get back to you. But he appreciates the question. 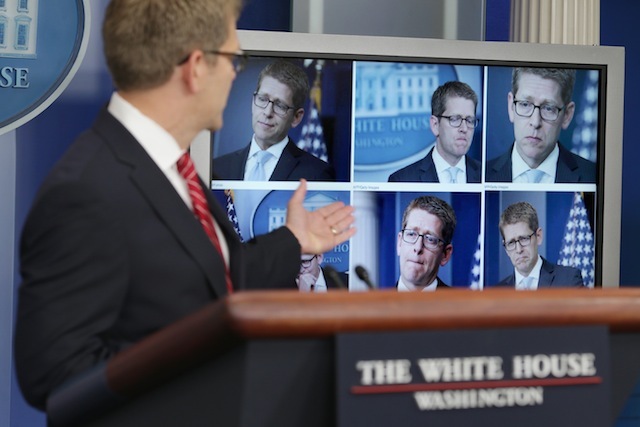 A Yahoo News analysis of the 444 briefings through June 18 that Carney has held since becoming White House press secretary has identified 13 distinct strains in the way he dodges reporters' question. Since Carney held his first daily briefing with reporters in the White House Brady Press Briefing Room on Feb. 16, 2011, for example, he’s used some variation of "I don’t have the answer" more than 1,900 times. In 1,383 cases he referred a question to someone else. But will he at least speculate on hypotheticals? No. In fact, he has refused to do so 525 times. In the following interactive, you can browse all 9,486 of Carney’s most-used responses and verbal crutches. The main function of a White House press secretary is to shape messaging for the administration, which often requires stymieing questions as a form of damage control. Reporters got several doses of that at Friday's briefing, including a rather repetitive back-and-forth over what kind of aid (arms? weapons? U.S. troops?) America is sending to Syrian rebels. "We have stepped up our assistance, but I cannot inventory for you the elements of that assistance. And as the president said, I cannot and will not get into some specifics about the assistance that we provide," Carney said. When pressed further? "We can't comment on specifics around our program." And further? "I'm simply saying that given the nature of the assistance that we provide, the way in which we implement our assistance ... I can't give you an itemized list or be specific about every single aspect," he said. "I think I've given the answer that I can give." Reporters also heard many "as you know's," some "I'm not going to's" and several referrals. The referral to another agency or person is one of Carney's favorite evasive maneuvers. During the 43-minute briefing on Jan. 25 alone, for example, Carney referred reporters to the Justice Department four times, the National Labor Relations Board twice, the State Department twice, once to the historic precedent of recess appointments, once to a New York Times article, once to a speech that President Barack Obama delivered earlier in the week, and once to the Defense Department. As should be abundantly clear, Carney doesn't have all the answers. As he recently reminded the gathered reporters at his briefing, he and his team are mere mortals battling an army of professionals bent on stumping him. "We have a team here that works really hard trying to anticipate the questions you're going to ask. The problem is, there's a lot of you and you're good at your jobs and you're smart. And we almost invariably do not anticipate every question that you ask. So sometimes we don’t have the answers, and sometimes we need to go back and get them," Carney said during the May 22 briefing. That was a rare moment of effusive praise for the press. It followed what had been a rough series of briefings for Carney amid controversy over the 2012 attack in Benghazi, Libya, the Internal Revenue Service scandal and the Justice Department's secret seizure of journalists' phone records. Those stories put Carney in a tougher-than-usual spot to speak for Obama and the White House, share information and shape the president's message, all without creating new controversy as he stood behind the podium. More often than not, the imperative to do no harm prompts a total nonanswer from Carney. This results in the "I have no personnel announcements" for you today, referrals to other individuals and other gems that the press readily anticipates and often mocks. Carney's recent predilection for saying "I appreciate the question," upon hearing a question he very likely did not appreciate, even prompted Politico to release a video montage May 14 of all those responses. With good humor, Carney acknowledged it the next day. "You know it’s a personal question, but a great question," Carney told CBS News White House Correspondent Mark Knoller, who asked whether Carney personally dreaded the briefings amid the controversies. "Do you appreciate it?" Knoller added, prompting laughter in the room. "You beat me to my punch line," Carney said. See more Yahoo News interactives at the new Yahoo Signal Tumblr.